I also made some fun button ornaments out of vintage and new buttons I’ve bought recently or had from grade school. 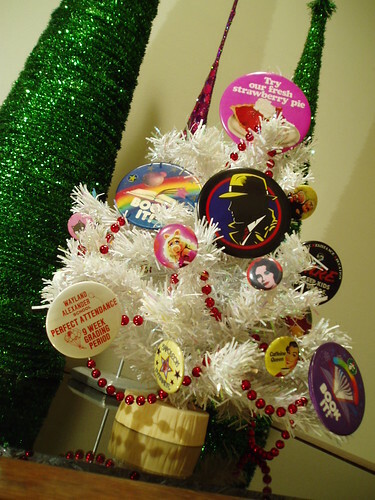 I decided to put them on a fun mini tree and show them off…you know you have some buttons that just need to be displayed that you’ve got stored away. Now’s your chance to show them off! Oh, and check out these super cute ornament that our designer, Jane, did at my work. I just lurve the zebra stripe! I can just see it now with a fabulous hot pink bow. So easy using just a plain white pearl ornament and Black Craft Twinkle Writer! Click here for full instructions and supplies. OK, out of here for now. I had a long day…capped off by a nice evening of photo taking with my flick friends and Starbucks (yum). My bed awaits! 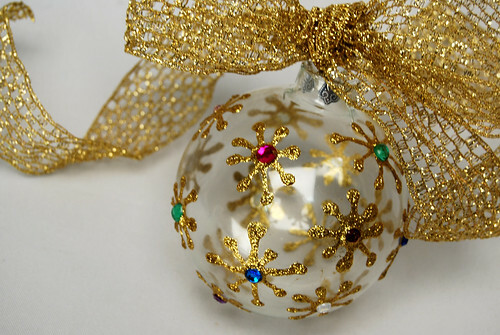 Very pretty ornament! I love the animal striped one too! Love the painted ornaments! Especially the zebra one! Another super swell idea from a crafty diva! Love the ornaments and the gold ribbon. I actually have a vintage scarf almost identical to the ribbon, and the retro feel of the ribbon and star-flakes really work together! Great ornaments Alexa! I love glittery goodies for the holidays! 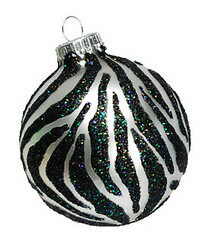 That zebra stripe ornament is impressive and very pretty!